I can’t believe it. Frieda’s become so western she’s actually started wearing a sari like some western women do – costumey, blingy and stiffly awkward. No need for the jewellery but the sari itself is a poor choice for someone with famously good taste. That drape :( weird that we are giving her brownie points for wearing a sari. She is Indian after all. The sari in itself is good.. But poor drape and excessive jewellery, especially the neck piece, ruin it.. I like it. The sari should not be imprisoned by tradition. The essence of style is to make something your own, after all. That’s what Deepika didn’t do at her own wedding, imprisoned as she was by Sabyasachi’s dictates. The poorly draped saree and ghoulish makeup is bad enough.. didnt even look at her hair! Jewelerry is fug! Looks like something one would wear to mohalle ki shaadi! Nothing about the bad makeup or that hideous hairdo ?!! Gosh, this is surely one of the awful ways one can appear in a sari . Ugly blingy blouse and sloppy drape. No likey. 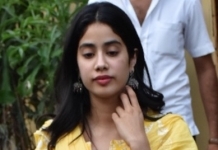 Or more aptly a serial look of Ekta Kapoor which bombed our tv a decade ago..
She looks like one of those NRI women who moved out of India in the early 90s and their desi fashion sensibilities got frozen in that era. OMG! That’s the exact same thought I had ? I hope she is doing well. I don’t want to say anything not nice. She seems to have been forced out of bed to show up for these events.